Today’s mind rant started because of a song. Obviously. After all, 99.99999% of my thoughts have some sort of musical overtone to them. People speak and I instantly recall songs where those same words were used in the lyrics. Synapses happen and memory recall sings in Patsy Cline’s voice, “Crazy. I’m crazy for feeling so lonely.” Then Ozzy starts to laugh and “I’m going off the rails on a crazy train” blares from ginormous concert speakers. I know… I’m not sick, but I’m not well. Hey! Wait! Isn’t that a song? Music plays a huge role in the internal workings of my mind. The thrum of the beat, the lyrics flowing their obscure messages, my senses picking up on key words that incite other thoughts, memories of days of misspent youth. My favorite radio station played a cover of “Never Say Never.” NINE words of the chorus sent me into a tailspin of thoughts, all rushing through at once while I was driving down Route 329. When I got to my destination, I could not remember driving there. I write women’s fiction/romance (and oh, by the way.. I plan on putting those 9 words in Love Unrehearsed somewhere so no copying). Add to that the fact that my mind is perpetually in the gutter. Memories of the 1980’s and some young guy in a leather motorcycle jacket that I swear I could still smell flowed in after that, causing a tickle and rush in my lower belly. New scenes, dialogue, and plans for Love Unrehearsed jumped right on top of the dog pile. Torments of trying to determine who originally sang that song then caused the massive Google search. Soon I had my answer. Romeo Void, 1982. Further proof that some of my brain cells that I didn’t kill in the 80’s still exist. So far today, every time I get up from my computer, each step I take is done to the tune of that song. I feel the urge to sneak beer in my massive purse, steal some guy’s leather jacket again to wear as proof of my rebellion, wear a few safety pins on my jeans, lie to my parents, and have some fun in the back seat of a car. Right after I take a nap. Some people are like a Slinky-not really good for anything, but you still can’t help but smile when you shove them down the stairs. 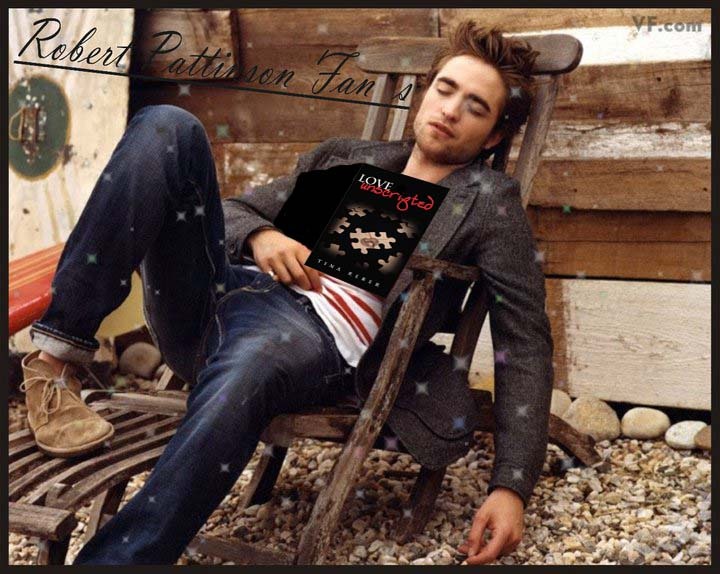 Here it is – definitive proof that Rob’s been curling up with Love Unscripted on his downtime! I had heard rumors but didn’t believe them! Is he taking notes from Ryan Christensen or thinking about calling his manager for a shot at the lead role in the movie? Regardless, I couldn’t help myself. Sorry Rob.